There is a Republican in the White House. Why am I not back in demand? Today at the Worldwide Headquarters of Manhattan Infidel™ I am feeling a bit nostalgic so I’ve decided to interview a figure who used to be famous back in the first decade of this century. 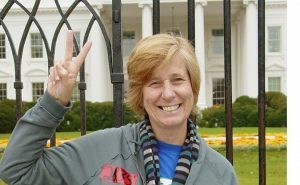 I am referring to none other than anti-war activist Cindy Sheehan. MI: Good afternoon Miss Sheehan. MI: Now let’s start off with a brief recap. Most are familiar with your story. Your son was killed in the Iraqi war and you became an anti-war activist during the Bush administration. CS: Yes. The Bush Administration. Those were good times. The press used me at every opportunity to embarrass the President. I was in demand. My moral authority was hailed by the New York Times. I was on the verge of forcing a paradigm shift in America. MI: And then what happened? CS: Barack Obama was elected. Suddenly the press wasn’t as interested in using me to embarrass a sitting president. MI: Even if the Iraqi war and the war in Afghanistan continued and President Obama was killing more people with drone strikes than Bush ever did? CS: Well I understand why the press ignored me then. War is moral when Democrats do it. CS: But there’s a Republican in the White House now. Why is the press still ignoring me? I though they were my friends. MI: I have no idea. MI: You’d like bigger bread? MI: [gestures to the meat] You could just fold this… though. CS: This bread is too small, like my time in the spotlight. DH: What’s all this about a limited time in the spotlight? MI: ‘Fraid so. The press will move on once you’re not useful anymore. DH: But….but….gun control! Hey, what’s with the small bread? DH: Let me see that. I keep folding it and it keeps breaking. What the hell? CS: Who are those people with you? DH: It’s my armed security team. CS: But you’re a gun control activist! DH: Are you threatening me? Security! DH: Don’t worry ma’am. They are Democrats. CS: Thank god. Just don’t take my small bread! DH: Like I’m going to listen to you. You’re not even famous like I am! DH: … so then it’s like this. But this doesn’t work, because then it’s all…hanging out. MI: Well I’ll leave alone to battle the small bread. DH: Ban assault small bread! I am now an anti-gun, anti-small bread activist! CS: The moral authority of large bread cannot be questioned! And so ended my interview. You know they were right about one thing. Large sandwiches are better. I think I’ll head over to Subway and get a foot long. Cold cut combo. Maybe black forest ham. 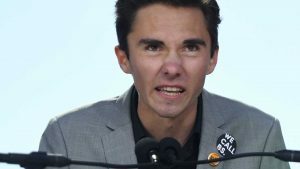 That’s a great interview, but who is “David Hogg”? I think he used to be famous.